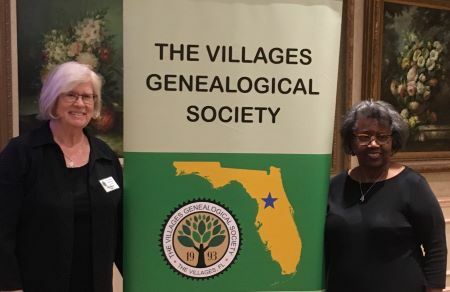 Welcome to The Villages Genealogical Society website! "Social Media at The VGS"
Deborah A. Abbott, Ph.D. presented two presentations today at our April monthly seminar and afternoon workshop: "Analyzing the United States Federal Census 1790-1940" and "Beginning Genealogy: Where Do I Start." Dr. Abbott made learning about these two subjects very entertaining and enjoyable while being informative. If you missed today's seminar, members will be able to see it under our members-only site on the VGS webpage. Habdouts & Video recordings of both presentations are available in the "Members Only" section of our website. Judy G. Russell, The Legal Genealogist, was our outstanding guest speaker at our March General Meeting. Her topic was "Shootout at the Rhododendron Lodge: Reconstructing Life-Changing Events." Judy went over the Who, What, When, Where, Why & How about this event and the process she used to reconstruct the event. She discussed her research plan using the Genealogy Proof Standard and also the ethical considerations and constraints if any family members are still alive. She also presented “Polls, Personality and Property- Using Tax Lists” in our afternoon workshop. Video recordings of both presentations are available in the "Members Only" section of our website. Source: Derivative Materials that offer alternate versions of the original: this source is abstracted, compiled, formed into a database, transcribed, translated or otherwise derived from the original. The 1900 and 1910 censuses lists the number of children that were born to each woman and how many were still living at the time of the census. A time line begins with your ancestor's birth and is filled in with various events in his life. Continue to fill this in as information becomes available to provide a picture of your ancestor's life. Several of the genealogy software programs assist you with this.